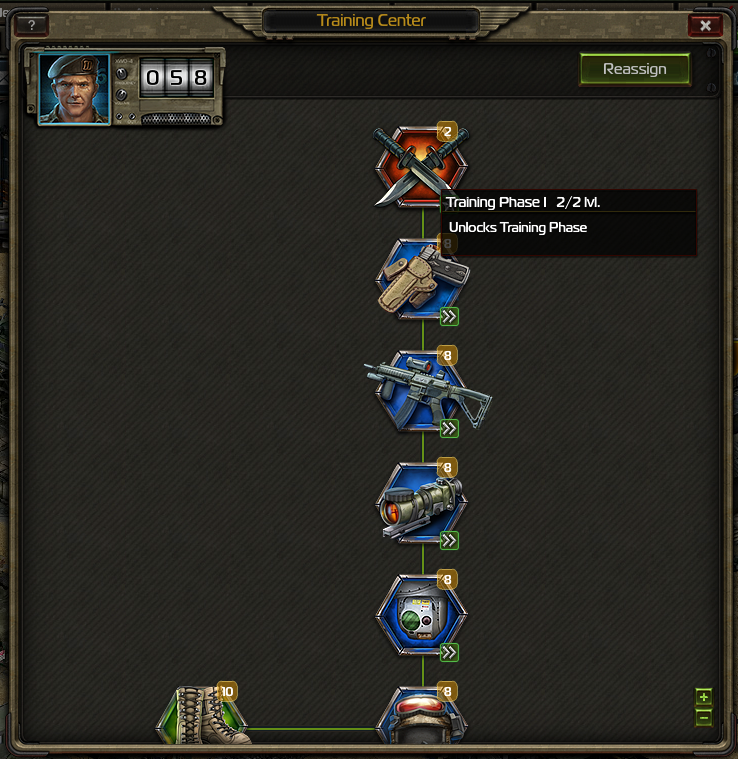 With the arrival of the New Training Programs in April, 2014, commanders can now elect to invest Drill Instructors in various new programs to further augment their base, production, contracts and upkeep. 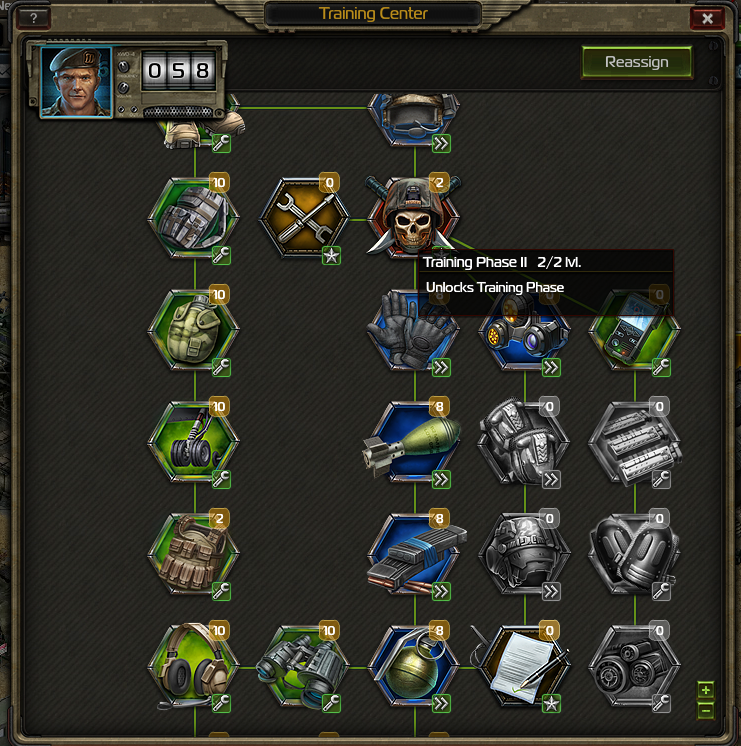 Not all of the new training programs will be immediately available to new commanders. Availability must be unlocked by completing specific Training Phases. Turrets are the passive-defensive structures that protect your base. Unlike walls, they do not need units present to counter an attacker. When raided, turrets can be disabled, just as units are lost. If disabled, the turret must be manually clicked again to begin the repair process. Turret repair times are normally 60 minutes per turret, which can be completed concurrently. This repair process can be initiated by the commander, or their friends. If the commander has purchased any M.A.R.S. Repair Vehicle (up to 5), these repairs are automated the moment the commander logs into the game, or immediately if the commander is currently logged in at the same time they are knocked out. The more M.A.R.S. Repair Vehicles the commander has, the faster the repair speeds, in increments of 5% up to 25%, mitigating the repair speed to 45 minutes. The Turret Repair Speed Training Program can further mitigate the time to repair in steps of 1.7% for each Drill Instructor invested, with a maximum additional mitigation of 51% at 30/30. The reduction can be stacked with the M.A.R.S Repair Vehicle for a total of 76% mitigation. This would bring the time to repair down from 60 minutes each to 29 minutes and 24 seconds by itself, or 14 minutes and 24 seconds with all five (5) additional M.A.R.S. Repair Vehicles. Analysis of the Turret Repair Speed Training Program would indicate that this program would be most beneficial for new commanders starting out in Zandia, when lots of small raids and bands of light and heavy infantry tend to be thrown around frequently. The mitigated downtime means you can be up and running in less than 15 minutes from your last raid. Handy if you are being attacked repeatedly! Try Jeff’s tips today!